Even those who know nothing about art will know of Claude Monet. They may not describe the French painter as the creator of a whole new style of art, Impressionism. But they will recognise his art immediately – the little dashes which capture the fleeting light and colours of a landscape, a historic building, or most famously, waterlilies reflected on water. Monet’s paintings are highlights in the world’s most prestigious museums. But forget the canvases – he declared his ‘most beautiful masterpiece’ was, in fact, his garden in Giverny. After being left to ruin, his gardens are now fully restored, and one of Normandy’s most popular tourist destinations. But are they suitable for a family visit – with young children? In this post I’ll take you on a family-friendly tour of its three main parts – Monet’s colourful home, the flower garden, and the water garden. I’ll give you some tips to get the most out of your visit with kids, and share some advice on when to visit. And I’ll end with our London postscript – how Monet’s waterlilies will always remind us of a special day, when our children were young and we were welcomed by a carpet the colour of fireworks. It was love at first sight. As soon as Monet spotted this place in Giverny from his train window, he knew he wanted to make it home. To begin with, from 1883, he rented the property and its two acres of land from a local landowner. He poured his heart into transforming the house and gardens into a warm family home, for his blended family of eight children and step-children. Within ten years Monet’s career was on the up, meaning he could buy his cherished home. He added greenhouses and a new studio, purchased a second plot of land to turn into a water garden, and employed seven gardeners to care for this labour of love. Monet’s house is as colourful as his paintings. Outside, vibrant green shutters and woodwork sing against the salmon pink walls. The colours are as memorable inside. A soft yet zingy yellow coats every surface in the dining room. 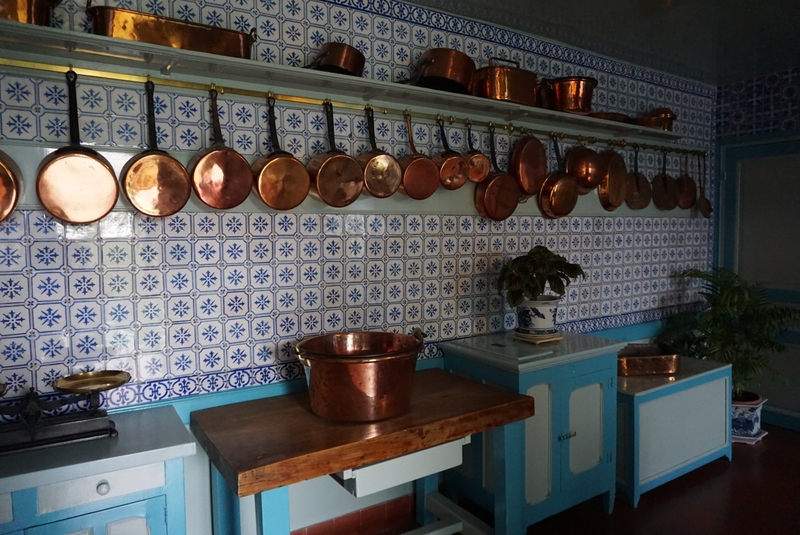 The tiled blue kitchen is filled with shiny copper pans, ready to cook up a feast. 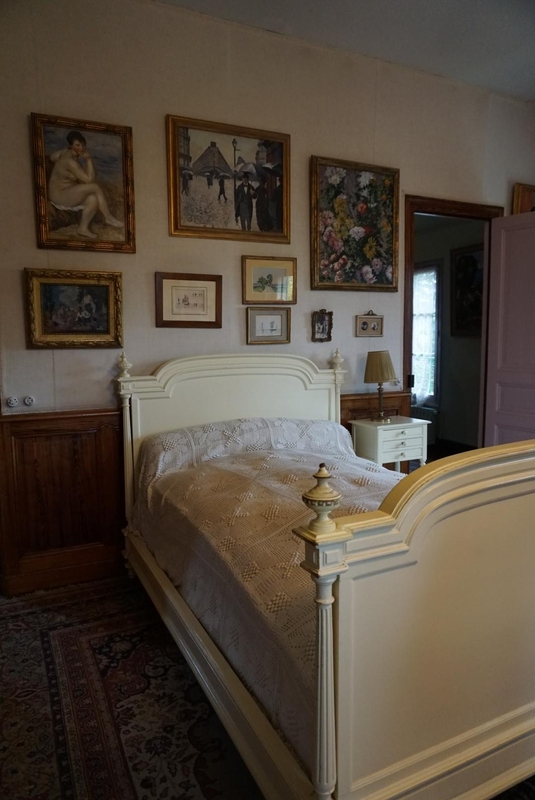 Monet entertained many artists and friends over his decades in this home. The garden constantly calls to me as I walk the set route around the house. Each window’s purpose seems only to frame the giant, outdoor canvas. 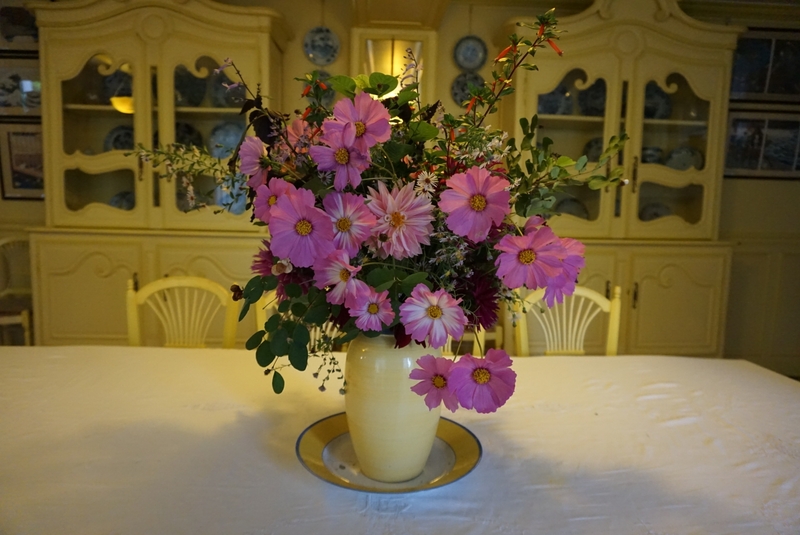 Centre stage are vases of flowers, cut from his beloved garden. I wonder for a moment how my conservator friends feel about the profusion of fresh flowers inside a historic property. The two rooms which give me the greatest sense of the man who lived here are his first studio, and his bedroom. Monet’s paintings cover almost every bit of wall in the high-ceilinged studio. The artist kept one work from each stage of his life, so it’s almost a visual autobiography. Intimate family photographs add to the cosy atmosphere. 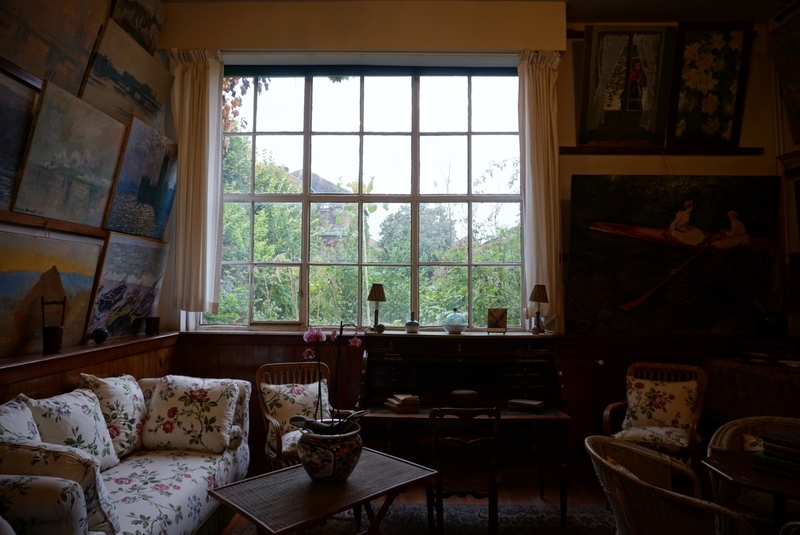 After he built his larger studio, Monet used this as a sitting room and it’s easy to imagine the room filled with conversation and the smell of fresh coffee. The sight of a rather modest bed really brings home to me the man behind the masterpieces. His work, fame and legacy are enormous, but this piece of furniture reminds me that he was a real person – one whose physical body could easily be contained within its surprisingly small frame. 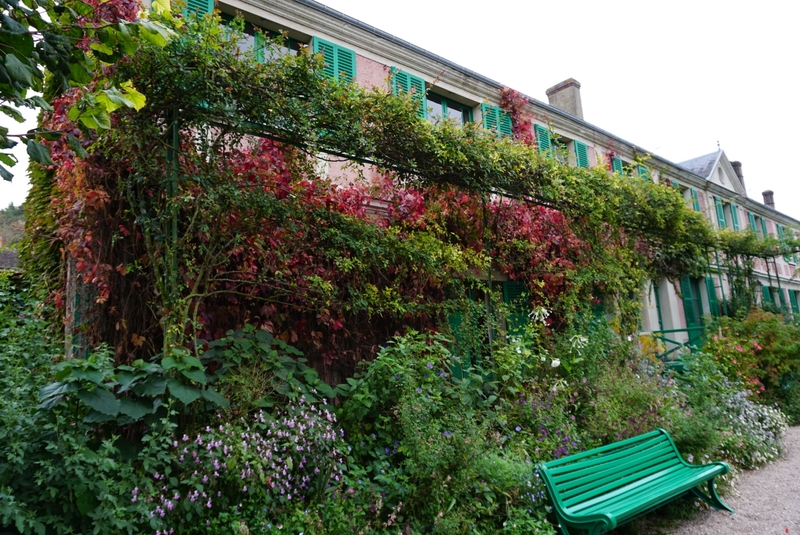 Monet loved Giverny so much that he never moved away, spending over 40 years of his life here. It was in this bed that he took his last breaths, overlooking his joyous garden. Whilst I found the house captivating, it is the least family friendly part of Giverny. Large bags and buggies are not permitted inside the house. There is no interpretation for younger visitors and the set route is very congested. Very young ones will no doubt be enticed to cross under the rope barriers. But if you have older children, or someone to keep watch whilst you dash round, it is well worth seeing, if only to get a sense of the man behind that now infamous name. At first, I found this garden so overwhelming I didn’t know where to begin. Here, it’s the flowers that are in charge. I honestly didn’t expect so much colour and energy in a garden in the dying days of October. There must be thousands, no, tens of thousands of flowers here, some of which tower above me. If I feel dwarfed by the height and sheer multitude of colourful plants, it must be even more impressive for children. I see Museum Girl captivated by the bright pink cats tails, studying them cautiously before she plucks up the nerve to stroke one. Museum Boy makes a fine collection from the fallen flowers littering the paths. We wander around, awestruck. Monet’s flower gardens inspired many of his paintings, and I think I know why – my photographs really helped me to see, and understand the place. Parts of the garden are more formally divided, whilst elsewhere the paths are barely visible through the brawl of flowers. Some garden paths are closed to the public, giving you unobscured views of the riotous flower beds. Amongst the claustrophobia of the beds, the openess of the Clos Normand is startling. Monet chopped down the spruce trees on the path leading to his home, replacing them with these giant plant hoops. 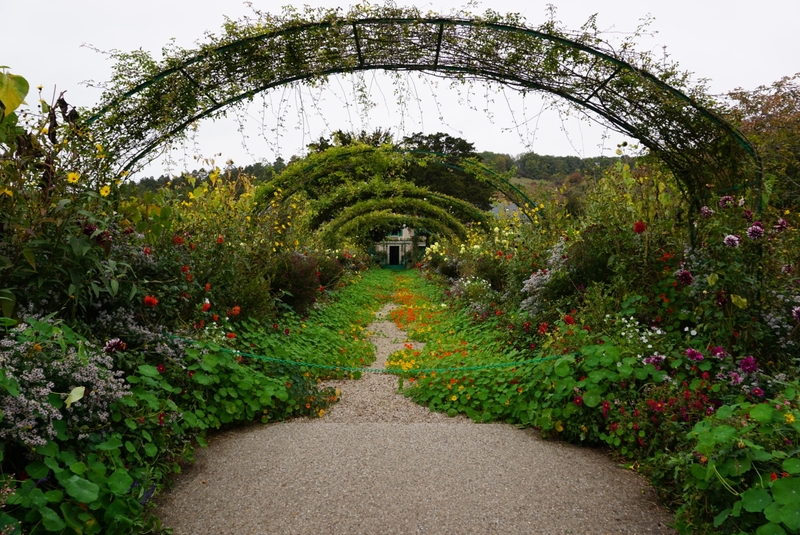 Whilst bright nasturtiums carpet the space on our visit, in summer it is lined by fragrant roses. 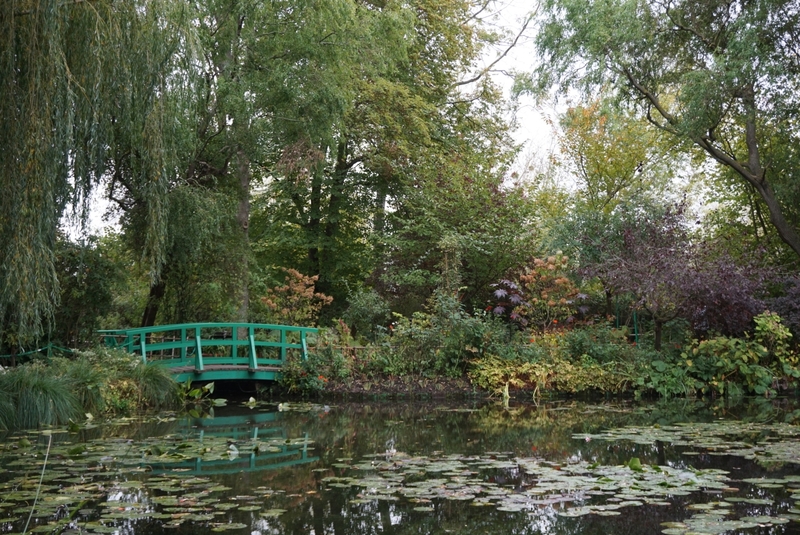 Ten years after coming to Giverny, Monet bought a second plot of land to turn into a water garden. Today there’s a stone underpass linking both gardens, but in Monet’s time he had to cross the road and railway tracks. Monet never visited Japan, but was inspired by his collection of Japanese prints, some of which adorn his home. We follow a little brook, the path darkened by a surprisingly dense bamboo wood, and criss crossed with small bridges. And then with the twist of a path, suddenly the space opens up and we are in front of the most beautiful lake. It almost feels familiar, probably from having seen it in many of Monet’s works as he painted this scene for over twenty years. 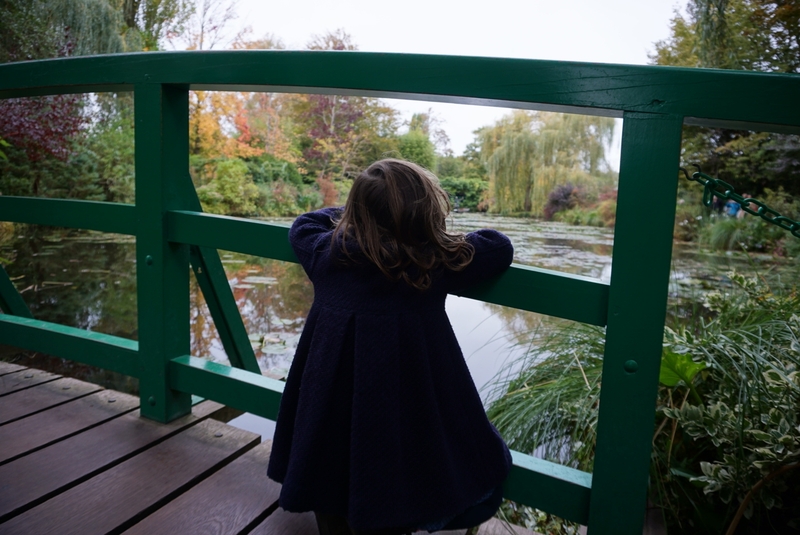 The green bridge at the end of it makes my heart stop a little – especially when my children peer over it, trying to work out if they can play pooh sticks in Monet’s lake. This snatched photograph is one I will forever treasure. 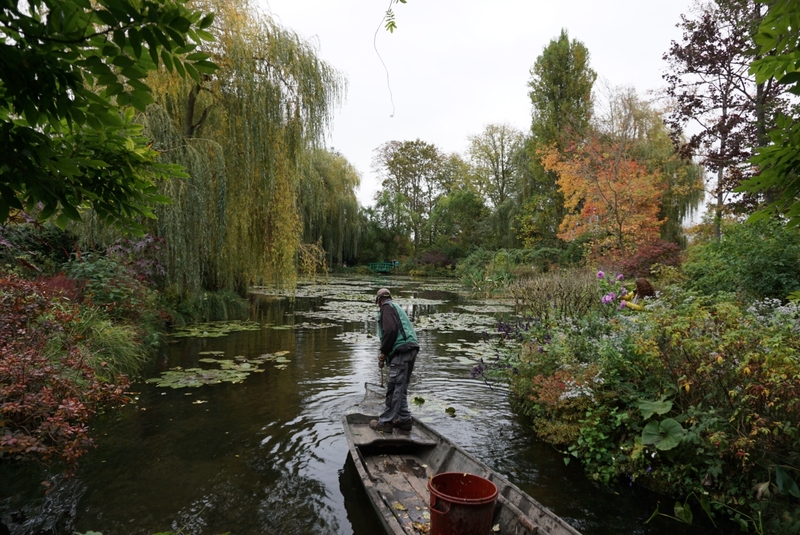 Working from his rowing boat, a gardener quietly fishes out fallen leaves from the lake. Gardens of this size and complexity require a huge amount of work, to create and maintain them. This lake was dug not once, but three times – twice by Monet as he created and expanded it, and the third time during the restoration works. In autumn, the lake is now sieved daily. I leave knowing why Monet called Giverny’s gardens his greatest masterpiece. What is there for kids to do in Monet’s Garden? 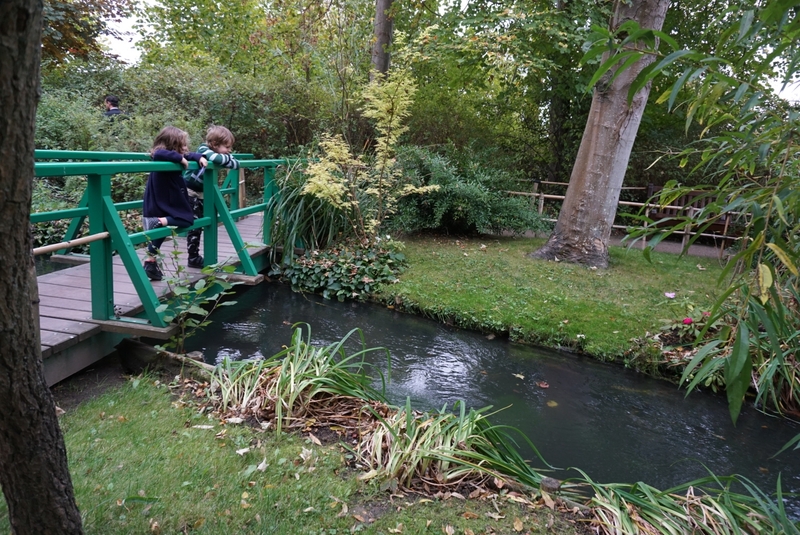 We found Giverny to be an engaging place to visit with young children. 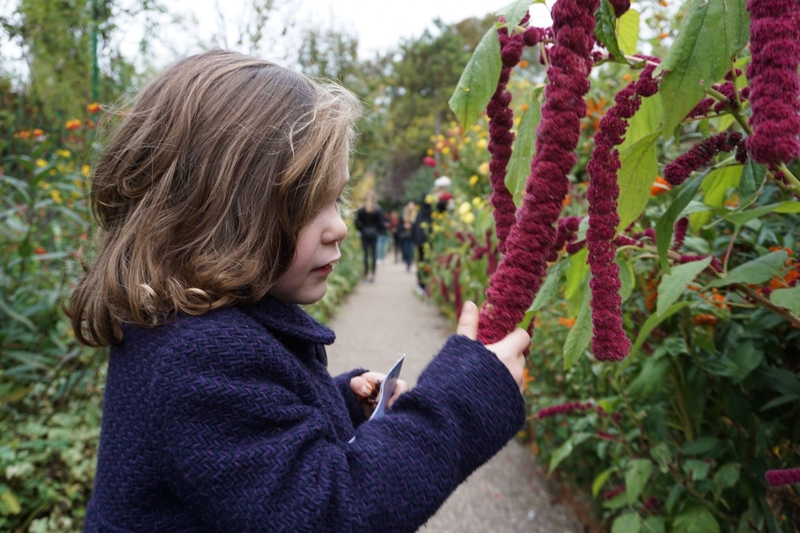 They delighted in exploring the garden’s colours and textures, stroking the ‘pink tails’, and collecting fallen flowers. A highlight was watching the kids play pooh sticks with nature’s cast-offs. But Monet didn’t design his lake for this – you’ll find a fast moving stream set back just behind the infamous Japanese Bridge. It’s a good idea to bring your art supplies – we saw older children drawing and sketching from benches in the Japanese Garden. A family trail is available, although only in French – which could be good for teenagers learning the language. Young animal lovers might enjoy searching for the chickens, on the same side of the garden as the gift shop. 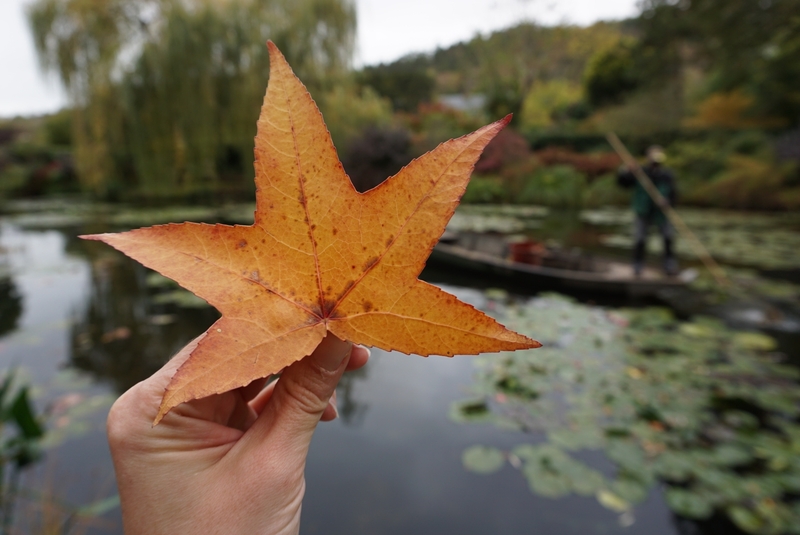 When is the best time of year to visit Monet’s Garden in Giverny? 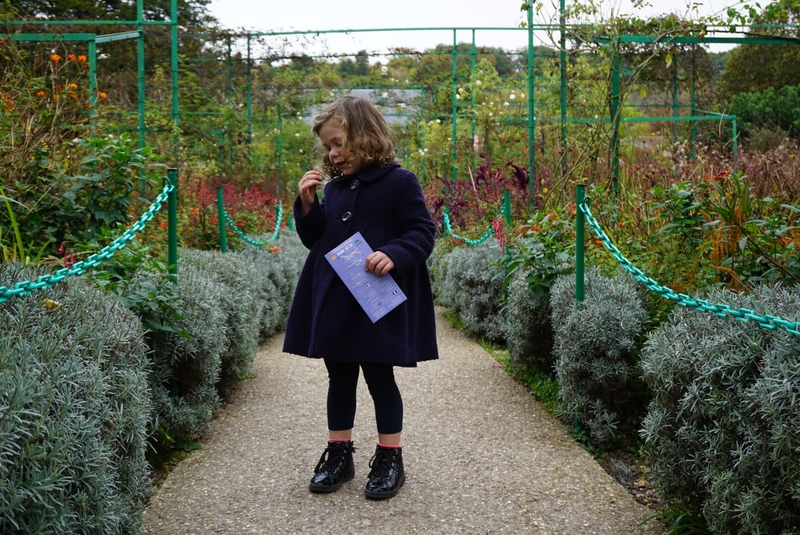 We loved visiting Monet’s garden in Giverny during October half term. The flower beds were still a riot of colour, and the autumn leaves dazzled against the greens. 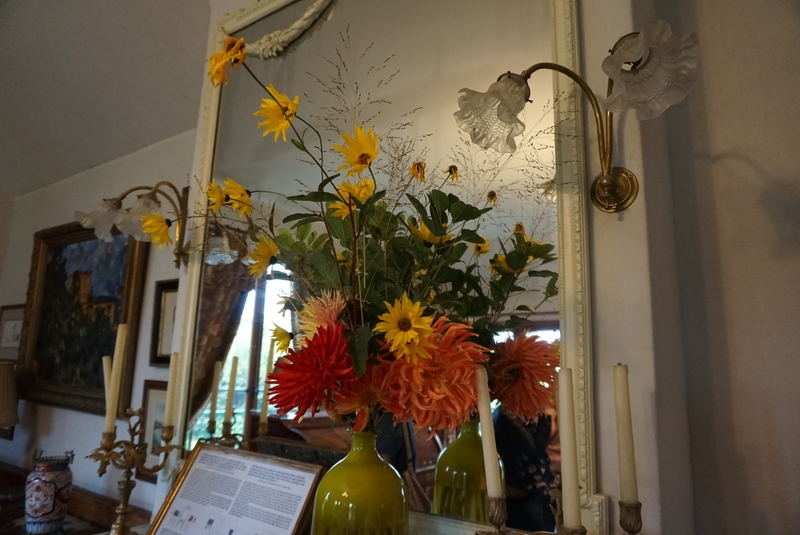 Whilst Giverny was the most popular place we visited in Normandy, it was a steady trickle of visitors, rather than the deluge of the summer months. 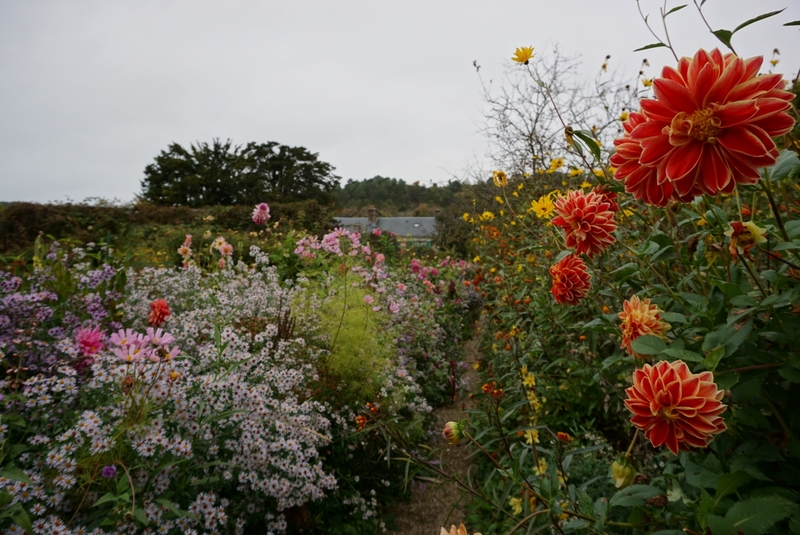 But, like all well-planned gardens, Giverny will be beautiful whenever you visit. It is open to the public from the end of March until the beginning of November each year. During Spring, there’s tulips, poppies and wisteria to greet you, whilst in Summer the famous waterlily flowers open. A guide to Giverny through the seasons is available on the Foundation Claude Monet website, just click here. 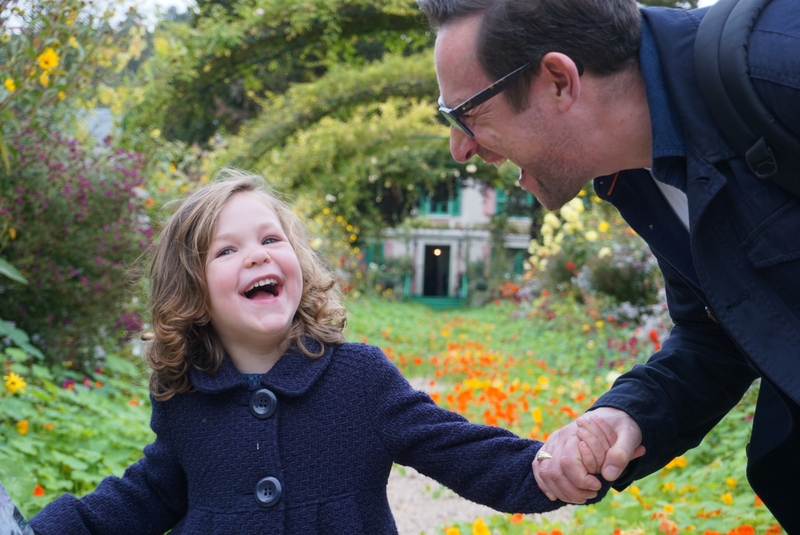 Quite simply, Monet’s garden in Giverny is a beautiful, spell-binding place which works its magic on everyone, regardless of their age or education. You really don’t need to know anything about impressionism, art or even gardens to enjoy a visit here. It’s an accessible way to introduce children to Monet and his art, for sure. But it’s also a magical place, worth seeing in its own right. I think Giverny will be one of those places we remember, and long to revisit, forever. A few weeks later, just round the corner from our home, we suddenly found ourselves back in Monet’s beautiful garden. 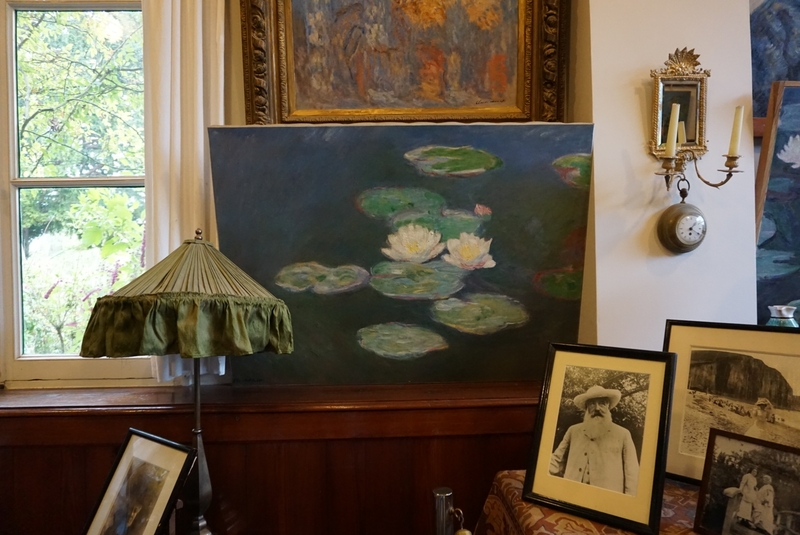 There, in a small display in our local museum, was one of Monet’s famous waterlily paintings. The work sings in the intimacy of the space. Even the youngest visitor is invited to linger, with a reading corner and family trail. I once read that Monet’s waterlilies represented the cataracts impeding his vision, and thought these paintings were imbued with sadness. 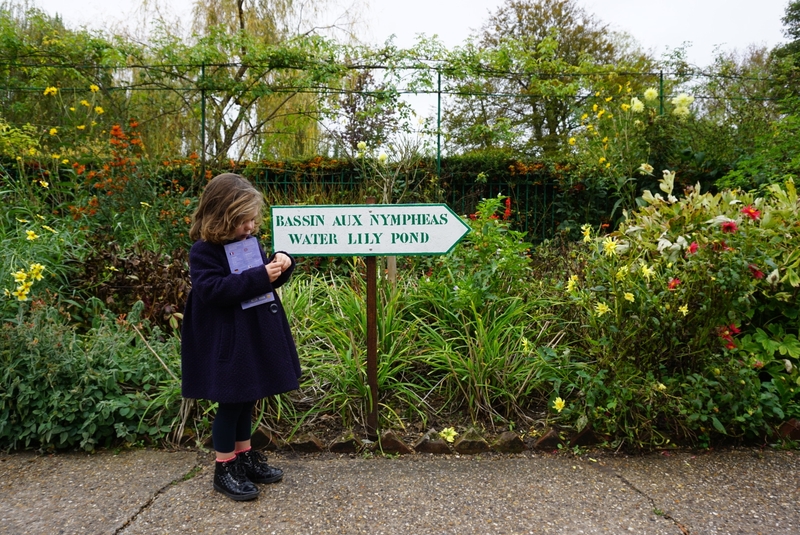 After our visit to Giverny I see could now see them for what they are – love letters to his garden, and a celebration of a life’s work. 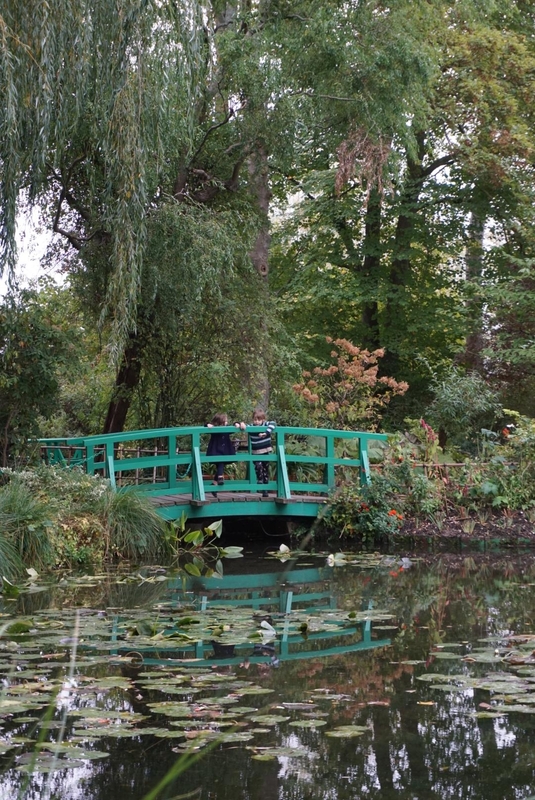 Claude Monet’s House and Gardens are open daily from March 22 to November 1, 2019. 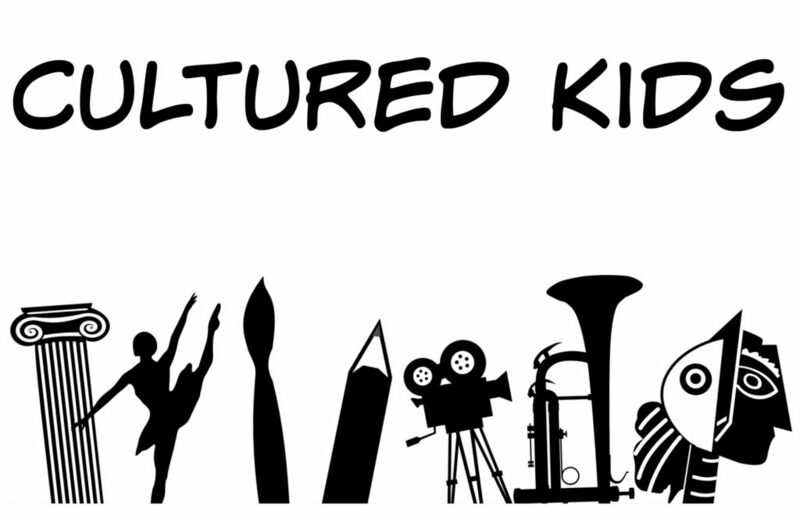 Adults: €10.20, Children 7 and over: €7.20, Children under 7: FREE. 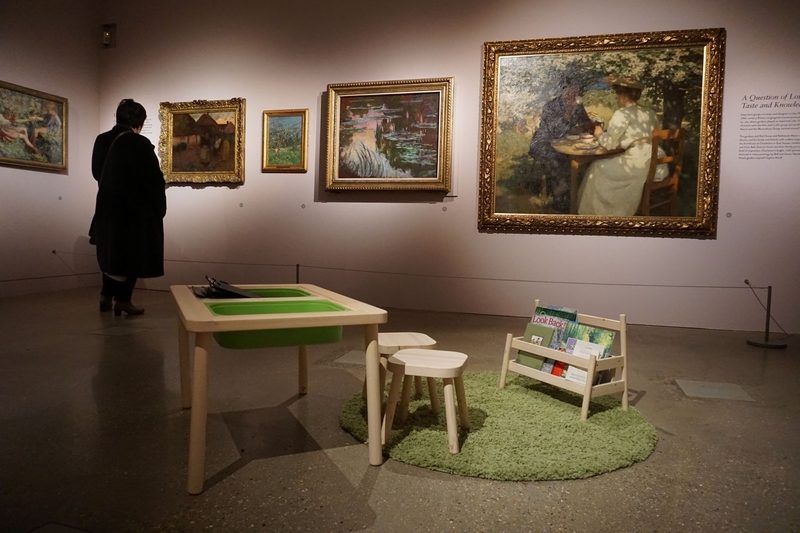 The Enchanted Garden is at the William Morris Gallery until 27 January 2019. 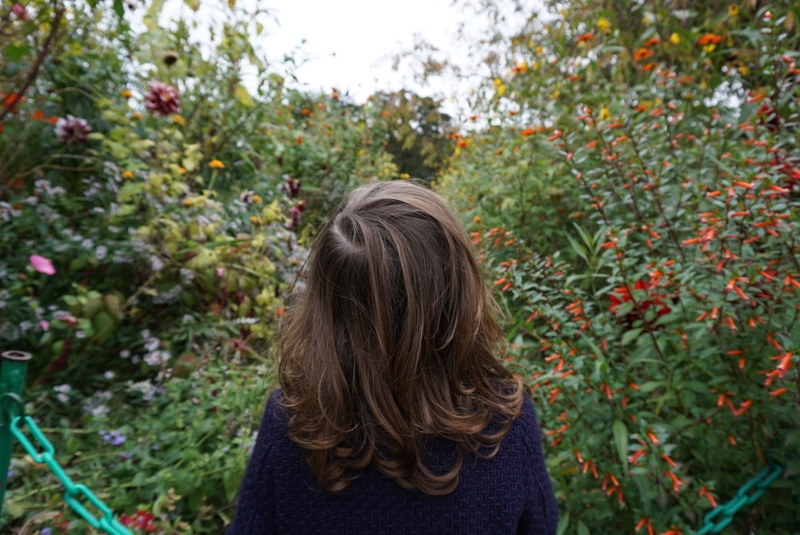 We visited Monet’s Garden in October half term 2018 with Museum Boy (6) and Museum Girl (4) and visited William Morris Gallery in November and December 2018. Thanks so much! It’s so photogenic, at one point I had almost 50 photos earmarked for this post! The family would definitely be happy to let you snap away here. How lovely to have your own waterlilies. The house looks as if Monet has just stepped out for a while! I’d love to visit and see the famous bridge and garden as well. Doesn’t it just! Such a good restoration, it felt so homely. I bet that was a beautiful kitchen! His gardens are so magical, they could only be made with love.